1. heat oil in a large pan, use medium heat. 2. Saute pork until it turns slightly brown. 3. Add garlic, onions and tomatoes. Sauté for a few minutes until tomatoes wilted. 5. Season with patis, salt and pepper. 6. Stir-fry for 2-3 minutes until blended. 7. Pour in water and bring to boil. 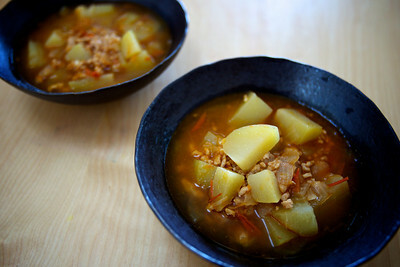 Cover, lower the heat and let it simmer until chayote is tender. 8. Season again to taste. 9. Remove from heat. Transfer to a serving dish. Serve hot. I really　want to have it!